The DX hygienic pump series is state of the art for the food, pharmaceutical, chemical and cosmetic industries. The complete sanitary design, in compliance with standards EHEDG and 3A, ensures maximum sanitisation. These pumps are top rated for ” Clean In Place” and ” Sterilising In Place”. The geometry of the pumps is designed specifically to allow drainage and avoid dead zones. Each component is manufactured with the highest level of finish and utmost cleanliness. As well as the parts that come in contact with the product, the block and base plate (when requested) are made of stainless steel (standard in AISI 304). The available fittings include DIN 11851, Clamp ISO 2852, Clamp ASME-3A, Clamp DIN 32676, RJT, SMS 1145 and lastly Garolla and Macon for the wine industry. DX Series: the drive is coupled directly to the pump via a flange. This solution is extremely cost effective and compact, considerably reducing installation costs and simplifying maintenance. The forces generated by the hydraulic part are supported by the drive itself. Each drive used is adequately selected based on their specific technical parameters and are subject to numerous duration tests with heavy loads. The DXC series is a hygienic pump with pin, standard to the DN series. This solution combines excellent sanitisation characteristics thanks to the design and casing completely free of dead zones and stagnation, together with the performance of the pin-type joint patented in the Diamond series. Lubrication of the pin is independent of the pumped product, therefore it is also suitable for abrasive fluids. The DXO series is a hygienic pump with open joint. It is the solution with the best sanitisation characteristics thanks to the design of the casing and the rotating parts completely free of dead zones and stagnation. The pin-type joint has been suitably sized to guarantee long duration. Lubrication of the joint is guaranteed by the product thanks to its open design, therefore it is suitable for non-abrasive fluids. Performance improves considerably when pumping lubricant products. 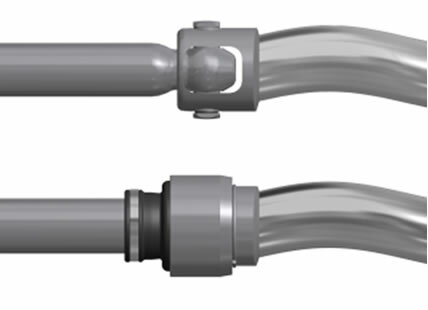 JX Series: the drive is connected to the shaft inlet via a flexible coupling. This configuration is the best solution in terms of performance and durability. All the forces generated by the pump are absorbed by the bearings in the housing. These bearings have very high resistance against loads. They are assembled with extreme precision on the highest quality manufactured parts. It is the best solution when you want to guarantee duration and reliability, yet with greater installation space requirements. The bearing unit designed by us is modular and can be adapted to a DX Series pump with lantern. It is state of the art for this type of installation. The pin-type joint, the actual heart of the single screw pump, is the best solution of its type on the market. It offers greater duration, reliability and maintenance costs, managing to combine extreme compactness with unrivalled strength. Its particular manufacturing enables the sub-division of axial loads and torque in different elements, making it one of a kind. As well as the above, replacement of worn parts is cheap thanks to the bushes in the worn zones, avoiding costly replacement of parts (rotor, drive shaft, and female drive shaft. To resist high pressure in the pump casing up to 12 bar, the pin can be hydraulically balanced. Open joint with superior sanitization characteristics. Lubrication is guaranteed of the pumped product thanks to the mechanical geometry that enables direct entry in contact with the sliding parts. This joint is particularly strong thanks to the dimensions designed to ensure its performance despite the lack of lubrication with specific products. The biggest benefit counts in its fast maintenance, for assembly and dismantling there is no need for any tool or product for sealing or lubricant. Replacement is cheap and extremely fast. The base plates are characterized by considerable thicknesses are very strong. They are made in stainless steel as standard. They can be provided with hygienic housing, with adjustable anti-vibration, in the trolley version or on skids, based on the client’s specifications. The parts in contact with the product of the Diamond DXC and DXO series pumps can be in stainless steel (AISI 304 e AISI 316), on request in other materials such as Duplex and Super Duplex. All parts have excellent finishes and the casings are polished to ensure utmost sanitization of the surfaces. Tensional stress and pulsating flow very low. The effect of the centrifuge is reduced to the minimum thanks to the low operating rotations and the mainly axial development of the pump. Different sealing systems can be installed, each solution being suitable to specific usage The types available are: single acting mechanical seal, with quench, double acting mechanical seal back to back or tandem. The type of seals are all interchangeable on the standard pump. Each solution was carefully engineered while taking into consideration all the operating conditions. You can also install various types of mechanical seals based on the application. 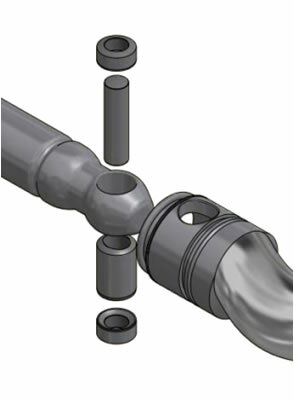 The inner seals are in the advanced position for greater coverage of the pumped product, promoting its duration and cleaning. The Diamond series is based on the concept of modularity in every characteristic: hydraulic parts, casing, seals, base plates, housing, drive shafts. 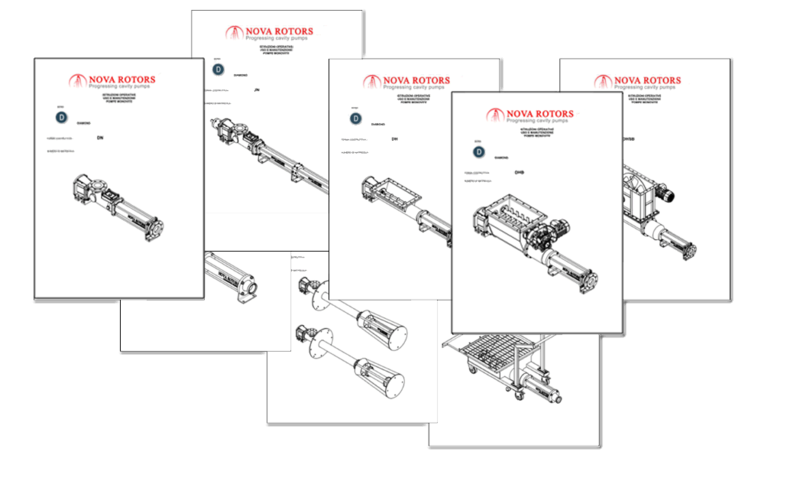 Each part can be manufactured in a series of variants without changing the structure of the machine, while keeping the main spare parts standard. Duration, efficiency, reliability and low consumption. With the Diamond series, we have reached the maximum levels of technological development in every aspect. The Diamond series was designed to be versatile whatever its use. For this reason it can be set up with various options and accessories suitable for every field of application. As well as the above, the peculiar features of the single screw pump are naturally taken advantage of with various types of fluids pumped, from low to the highest viscosity, clean and containing solids varying in size and nature. Al the drives which are installed on the Diamond series have been tested for long periods and subject to strict and rigorous technical checks. We can install both electric and hydraulic motors. All the models of reducers and variators present determined characteristics in terms of strength, size of the bearings and the quality of the gears. Maximum performance level, exceptional operating efficiency thanks to the optimum volumetric yield and high pressure and consumption reduced to the minimum. All the Diamond series hydraulics were calculated to guarantee the maximum found on today’s market. Each part is manufactured according the highly restrictive quality specifications. Finishes and precision of each part are the basis of each pump manufactured. All parts are subject to specific controls based on their characteristics and functionality. The Diamond series is designed to ensure easy maintenance and normally require on the replacement of a minimum number of components .In particular the joint bushes allow the replace of the same without having to replace shafts and rotors. The costs of maintenance are really reduced . 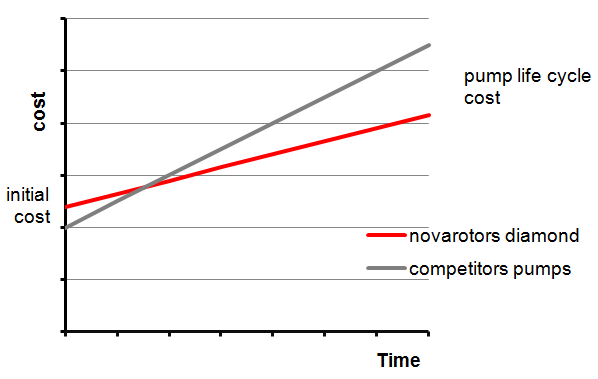 The cost of the pump, considered in his full life cycle , is highly competitive . The Diamond series, thanks to the compactness of its elements combined technical success without comparison at very competitive costs. The modularity allows you to make the right solutions depending on the application to avoid paying for features you do not need, all in favor of its competitiveness. 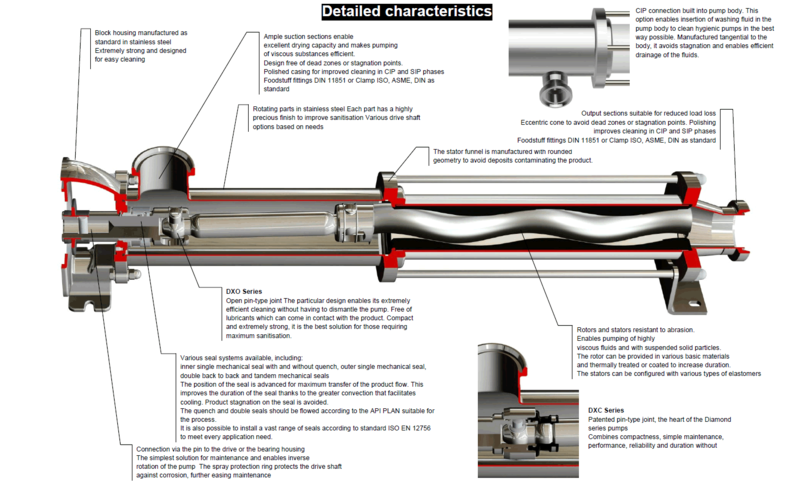 The peculiarities of the hydraulic parts of the progressive cavity pump allow excellent self-priming (up to 7m). The Diamond series were designed to create the minimum loss possible in the pump body, thanks to large sections and a joint compact design and fluid dynamic. The pumps of the Diamond series are easy to install due to compactness, simplicity of operation and operational flexibility thanks to the various features included. Each pump comes with clear and detailed operating instructions. Orders are followed by experienced and qualified staff that integrates in providing detailed documentation on demand and specific for the product supplied.